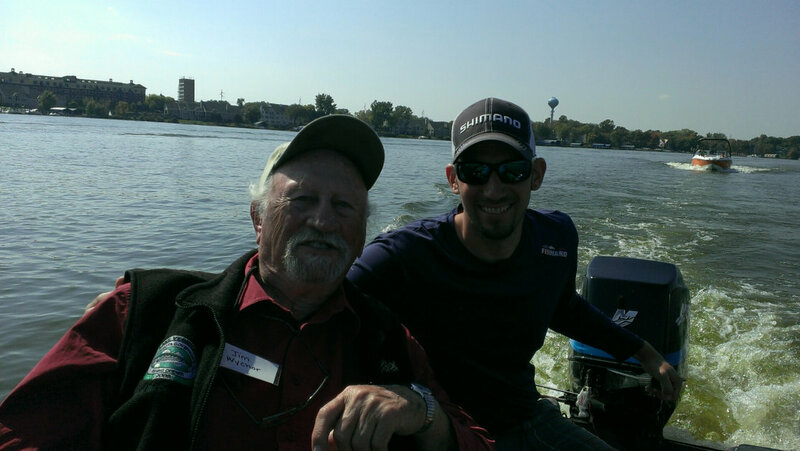 Today was the Take a Vet Fishing event on Lake Minnetonka and what an event it was! The event was extremely well run by everyone that had a hand in it and I was honored to be a part of it. I was paired up with the team of Adam and Jim Wychor. Adam is an Iraq war veteran and his grandfather Jim is a Korean war veteran. I was asked if I would be a walleye guide for the day and I happily accepted. Much to my dismay the walleye were cooperative on Minnetonka this morning and from the moment we started until just about noon the action was fast and furious. We caught upwards of 30 walleye with a few doubles. Jim and Adam really put the hurtin on em, in fact they kept me so busy I didn’t really have time to take pictures. All in all it was great day on the water and I made a couple new friends out of the deal. The next time you have an opportunity to volunteer your time for America’s veterans please take full advantage of it, you will be happy you did. Here is a picture of me and my new friend Jim. P.S. I believe that Jim and Adam may have won the trip to Moosehorn Lodge on Lac Suel in Ontario, Canada donated by Linda Rice. Congratulations guys!!! This weekend is the George Wahl Memorial Muskie Tournament…a tournament that I look forward to fishing every year. It is an eleven hour tournament this year that consists of all of the best metro waters including the tiger muskie stocked lakes. Please come out and fish it to pay your respects to George Wahl who was a huge advocate for muskie and muskie stocking. The best thing about this tournament is that all of the proceeds go right back into our fisheries to support the thing we love the most…after our wives and kids of course……MUSKIE FISHING!!! Have fun and good luck! See you on the water!